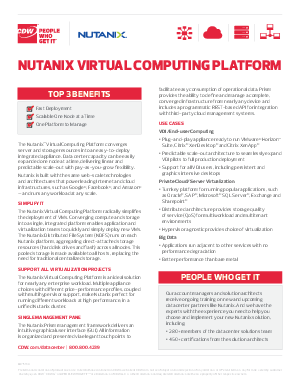 The Nutanix™ Virtual Computing Platform converges server and storage resources into an easy-to-deploy integrated appliance. Data center capacity can be easily expanded one node at a time, delivering linear and predictable scale-out with pay-as-you-grow flexibility. Nutanix is built with the same web-scale technologies and architectures that power leading Internet and cloud infrastructures, such as Google®, Facebook®, and Amazon® — and runs any workload at any scale.